Reuters- Nasrin Sotoudeh, an internationally renowned human rights lawyer jailed in Iran, was handed a new sentence on Monday which her husband said was 38 years in prison and 148 lashes. She was jailed in 2010 for spreading propaganda and conspiring to harm state security – charges she denied – and was released after serving half her six-year term. The European Parliament awarded her the Sakharov human rights prize. The news comes days after Iran appointed a new head of the judiciary – Ebrahim Raisi, a hardline cleric who is a protégé of Supreme Leader Ayatollah Ali Khamenei. The appointment is seen as weakening the political influence of President Hassan Rouhani, a relative moderate. The sentencing of prominent Iranian human rights lawyer and women’s rights defender Nasrin Sotoudeh to 33 years in prison and 148 lashes in a new case against her is an outrageous injustice, said Amnesty International on Tuesday. European Union also reacts to the Nasrin Sotoudeh’s conviction. ‘The EU expects an immediate review of her sentence as well as the conviction of her husband Reza Khandan, who was sentenced to six years’ imprisonment in January 2019. The European Union also expects Iran to ensure that both Mr. Khandan and Ms. Sotoudeh’s right to appeal their sentences is protected.” The statement added. 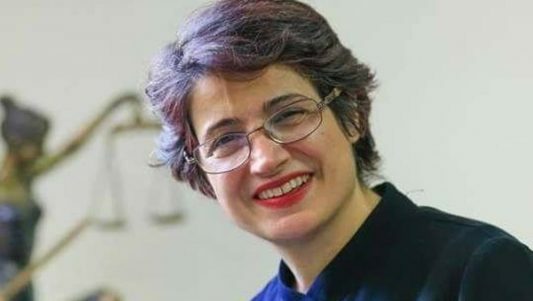 On Wednesday 13 March, Reza Khandan, Sotudeh’s husband said to BBC Persian that her real, definitive sentence is 12 years prison term, based on a law that says the maximum punishment for a convict is the most severe ruled for any one of his or her potentially multiple accusations. The judge may consider a 150 % increase in the prison term if the accused is faced with more than three accusations. Sotudeh was convicted to 33 years in prison for seven accusations in one of her cases, Khandan said.